Dog Beach in Ocean Beach. Photo courtesy of SneakyMoose. 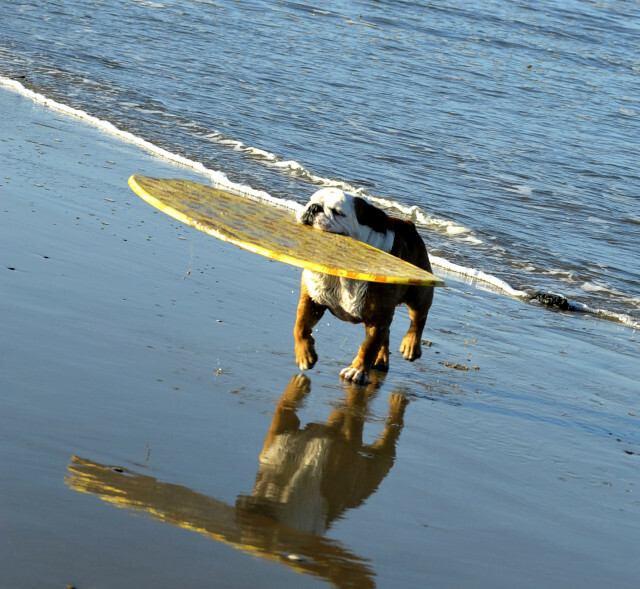 Sometimes a dog just has to go to the beach. Soak in some rays, get in a swim, dig in the sand. At gorgeous Ocean Beach, there’s a strip of sand and water set aside especially for dogs and people to play together, off leash and loving it, 24 hours a day. When the waves are up, you’ll see surfers out at Dog Beach Break, where the famous Rocky the Surfing Dog once rode the waves (as recounted in the 1994 film “Endless Summer II”). 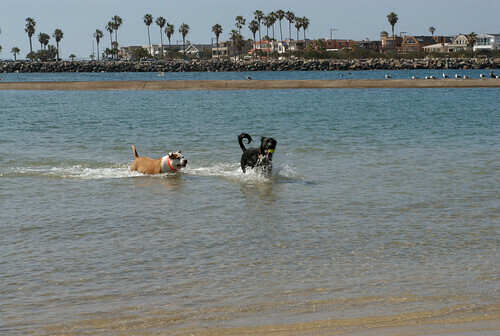 Dogs have been frolicking there since at least 1972, when the town council formally recognized it, making Dog Beach one of the oldest leash-free dog parks in the nation. You can read the actual article here. 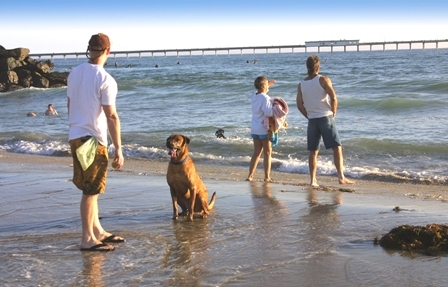 Where is your favorite dog friendly area in San Diego? The Gaslamp Quarter is best known for the swanky bars, great restaurants and hotels. But did you know the Gaslamp has over 100 retail businesses offering everything from fine art and spas to tattoo parlors and a boutique for dogs? Some of my favorite shops are located in the Gaslamp Quarter. The Wine Bank is the place to go when I need a great bottle of wine and sage advice. I also love Bubbles…A Unique Boutique when I’m looking for a fun gift for a friend. And this week is a great time to see all that the Gaslamp has to offer. On Wednesday, November 17th from 5-8 p.m., visitors can stroll, shop and learn about the Gaslamp’s many offerings as the shops come alive to showcase their goods and services. There will be live painting, home décor specials, wine classes, spa treatments and more. After you’ve strolled and shopped your way through the Gaslamp, stay for bite to eat. There is literally something for everyone. 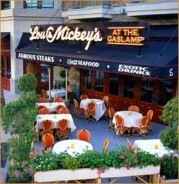 One of my favorite spots to eat at is Lou & Mickey’s at the Gaslamp. The restaurant features seafood, prime rib and exotic drinks in a relaxed and inviting setting. Haven’t been? Comment below and two lucky winners will each receive a $50 gift certificate to Lou & Mickey’s in the Gaslamp. Winners will be chosen, Wednesday, November 17th at 10:00 a.m. pacific. The puppy gurus at Dog Fancy magazine have released the results of their fifth annual Dog Town USA contest and guess where tops the list? Yep, for the second time, San Diego was rated the best big city in the country for dogs and the people who love them. 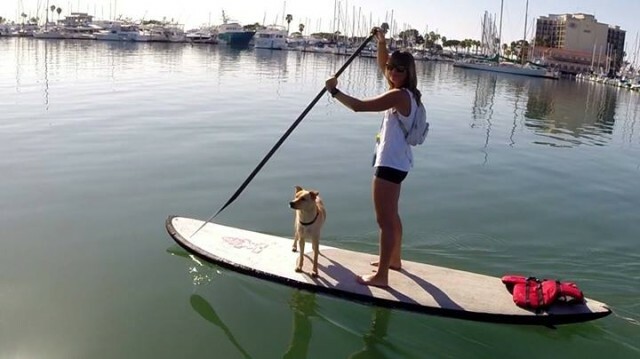 Editors and readers loved San Diego’s dog beaches and parks and our wide array of pet-friendly hotels, restaurants and more. One of my favorite things about San Diego is all the diverse neighborhoods located within the county. All in all, there are more than 100 neighborhoods and one each offers its own unique experience, personality and charm. While I could go on and on about each, my hands-down favorite is Ocean Beach…well “OB” as us locals like to call it. With each visit, this town’s laid-back, hippie beach vibe is contagious. I find myself truly relaxed as I sip mimosas in the sun, in awe with my latest fashion finds and entertained by the diversity of people and personalities that flock to this area. Whenever friends or family come to visit, I make sure to take them to Tower Two Café. While the food is just average, it’s the casual beach setting that draws me here…. Ok, and the mimosa beach buckets. (True story: the bottle of champagne comes in a colorful beach pale filled with ice, and it even has a cute little shovel attached!) Here, you can sit in the sun on the outdoor deck and look out into the ocean. It’s dog- friendly too, so your pup can enjoy the sun, socializing and table scraps. 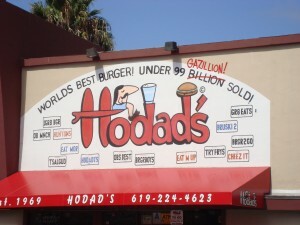 Hodad’s has been around for over 40 years and serves some of the best burgers in San Diego, even CNN thinks so. The catch, it’s so popular that there is almost always a line out the door but the burgers are definitely worth the wait. If you like fish tacos you must go to South Beach Bar & Grill. This little beach bar has won numerous awards and recognition and in my opinion, serves the best fish tacos I’ve ever tasted…try the Mahi taco, you won’t be disappointed, I promise!! 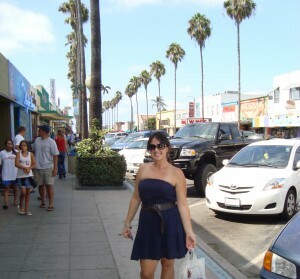 My go-to for cute shoes or accessories is Lola Luna on OB’s main drag, Newport Avenue. They always have the best shoes that you don’t see in department stores, which means most people won’t have them. Also, they always have a sale table outside with $10 shoes… what could be better than that?? good-quality clothes, shoes and accessories so you defiantly get what you pay for. So far, it’s proven impossible for me to leave this place empty handed. Also on Newport Ave. is the Closet. 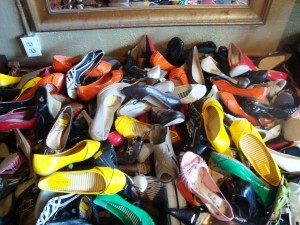 I like this place for cheap clothes and shoes for nights out or special events. Since the clothes are always changing to keep up with the latest trends I find that most visits here are either hit or miss. Of course a visit to OB would not be complete without stopping at the beach. True beach lovers can surf, swim and tan, while those who just want to take in the view can perch themselves on the boardwalk or walk across the OB Pier for amazing ocean views. There’s also Dog Beach, a leash free beach area where dogs and their owners can splash through the waves and play fetch on the beach. Every Wednesday from 4-8 pm, (and 4-7pm in winter) OB hosts a fantastic farmer’s market along Newport Ave. Here you can find fresh, locally grown produce and flowers, but there are also delicious food stands with all types of ethnic cuisine (mmm…sambusa) and live music, handmade jewelry and, drum roll please…… llama rides! Antiquing… not really my thing but if I was going to take up the hobby, I’d definitely shop in OB where they have the largest concentration of antiques and collectable in all of San Diego. 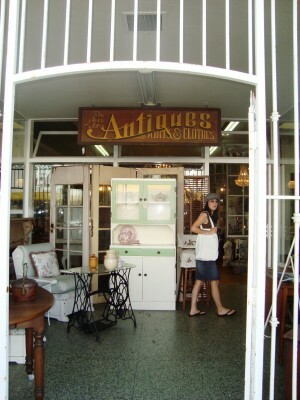 In OB’s Antique District, on Newport Ave. you will find an eclectic array of one-of-a-kind antiques, mid-century modern furniture, fine estate sale items, vintage jewelry and so much more. Claire’s on Cedros, an eco-friendly bakery and café, opened in Solana Beach earlier this month as the first freestanding restaurant in the U.S. to receive Platinum LEED certification. The laid back, dog-friendly restaurant offers organic eats (natch) for breakfast and lunch. Also in August, The Red Door opened in Mission Hills with affordable New American comfort food for dinner daily, lunch on weekdays and brunch on weekends. Priced below $20, dinner entrees include cornmeal-crusted Cajun catfish with sweet potato-crab hash and a surf & “cheeky” turf with sea scallops, braised pork cheek, roasted garlic jus and crispy polenta. Um, hello? Yum. Here’s a double – Barona Resort & Casinoin San Diego’s East County opened two restaurants in July and both are great values (and good for those of us playing the penny slots). Italian Cucina serves classic Italian dishes, pizzas, calzone and pasta all priced under $20 while Seafood Plaza offers grilled items, priced from $6.95 to $12.95, oysters at the raw bar and signature rolls at the sushi bar. In June, Cucina Urbana opened in Banker’s Hill adjacent to Balboa Park serving affordable Italian regional cuisine with a local farm-to-table ethos (no menu item tops $20). Crazy good starters include seasonal pickled vegetables, pate and other spreads served in mini mason jars and antipasti like amazing fried squash blossoms with ricotta, purple basil pesto and lemon aioli. Innovative pastas and modern spins on classic Italian entrees round out the menu. The restaurant is open daily for dinner. 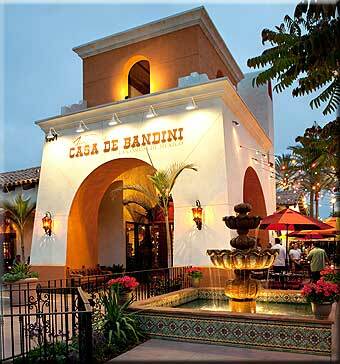 Also in June, a long-time San Diego favorite returned with the opening of Casa de Bandini in Carlsbad. For more than 25 years, the restaurant was a fixture in Old Town and, once again, diners can enjoy the ambiance of Old Mexico with strolling mariachis, brightly colored umbrellas on a sunny outdoor patio, authentic regional cuisine and giant, frosty margaritas. Open daily for lunch and dinner. Okay, I can’t stop at just five. Just one more because, in San Diego you can never have too many great new restaurants. Especially when they’re serving up frosty margaritas. Casa de Reyes in Old Town State Historic Park reopened in May with a new chef, menu and bright cheerful design. The restaurant has always been popular for outdoor dining so they doubled the size of the patio and added a new shade arbor and dramatic fire pits. Salsas are made fresh daily; each burrito is served with a specially prepared sauce, and chili rellenos are made the old fashioned way with a creamy, homemade cheese sauce. The restaurant is open daily for breakfast, lunch, dinner and – yes! – margaritas. a wet dog or a hot dog, which do you prefer? 1. This Saturday, watch adorable pups ride the waves during the 4th Annual Loews Coronado Bay Resort Surf Dog Competition at Imperial Beach. This free event, from 10 a.m. – 2 p.m., features talented surfing dogs as they surf in three different heats: small dogs, large dogs and tandem. 2. Head over to the UCSD campus this Saturday and Sunday and check out the 23rd Annual La Jolla Festival of Arts and Food Fair. The festival will have nearly 200 art displays, live music, food, book signings, and special events just for dads. The festival will also have a new attraction, Calle Color, a live street chalking exhibition. 3. Beginning this weekend, explore Park at Dark when the San Diego Zoo’s Wild Animal Park extends its summer hours to 8 p.m. As daylight turns to darkness, take nightime tours on Journey Into Africa, catch new summer shows with special animal encounters and watch as the park’s nocturnal creatures emerge. 4. Eat, shop and explore the Little Italy Mercato this Saturday from 9 a.m. – 1:30 p.m. More than 70 booths will take over Date Street and offer farm fresh produce, artisan foods and specialty items. There will also be live music and a special pet place. 5. Celebrate Father’s Day this Sunday by taking dad on a special kayaking adventure. Bike and Kayak Tours in La Jolla is offering all dads FREE kayak tours after 4 p.m. while the rest of the family will receive 10% off their tour.